In the tradition of The Hare with Amber Eyes and Running in the Family, a memoir of the author's upbringing by her grandparents in a fading mansion above Sunset Boulevard -- a childhood at once privileged and unusual, filled with the mementos and echoes of their impossibly exotic and peripatetic lives. Kathryn Harrison always understood that her family was beyond eccentric -- they'd breached the bounds of the unconventional. She was largely raised by her grandparents in an outsized Tudor confection of a house on the periphery of Bel Air, which she thought of as "Sunset," her kingdom of the imagination, inhabited by the past and its numberless artifacts. True wandering Jews, her grandparents had arrived in Los Angeles in the forties after dramatic, globetrotting lives. Harry Jacobs had been a fur trapper in Alaska, a soldier in the trenches of the Great War, a traveling salesman in a Model T. Margaret Sassoon had lived a privileged life as a member of a Jewish merchant family in Shanghai, turning down offers of marriage from Russian princes exiled by the Revolution. Kathryn Harrison grew up in an almost mythical realm of their letters and artifacts and stories -- until declining finances forced to sell the house on Sunset in 1971, and night fell fast. On Sunset seeks to recover that childhood, that place, those lives -- and does so with piercing poignancy. KATHRYN HARRISON has written the novels Thicker Than Water, Exposure, Poison, The Binding Chair, The Seal Wife, Envy, and Enchantments. Her autobiographical work includes The Kiss, Seeking Rapture, The Road to Santiago, The Mother Knot, and True Crimes. She has written two biographies, Saint Thérèse of Lisieux and Joan of Arc, and a book of true crime, While They Slept. She lives in Brooklyn with her husband, the novelist Colin Harrison. "I regard The Kiss as one of the bravest and finest memoirs ever written. So a memoir from Kathryn Harrison is a Big Deal and her new one, On Sunset, is stunning. Harrison never protects herself as a memoirist, and her vulnerability, intelligence, insight, curiosity, emotional honesty, and breathtaking talent as a writer are just some of the reasons On Sunset is as excellent as it is. This is Kathryn Harrison in top form." 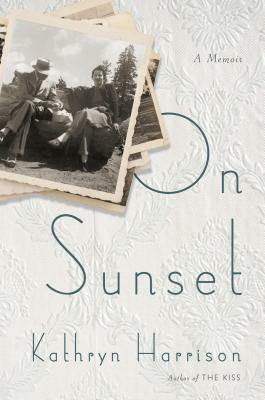 "[On Sunset] is not just memoir, not just family history, not just a meditation on culture and class, but a mystery, too… And this time [Harrison] has written a story — many stories, many characters, and a heroine, too (herself, that is) — to live alongside those by authors who made all of us want more: Dickens, Barrie, C. S. Lewis. And Lewis Carroll, too, who, in this account, is one of her favorites… On Sunset is more than one thing: not simply nostalgic, but tinged with anticipated sorrow and grief. Harrison’s touch is light (she’s a gorgeous writer)… As wise and all-seeing as it turns out to be, [On Sunset] is also a mostly happy story... It will, as with the best, make you laugh and cry. And it will make you remember how it was to be a child." "Undeniably rich... Harrison is nothing if not a magnificent writer, and there is something deeply satisfying about her sentences. A kind of internal rhythm dictates, with utmost precision and nary a stray adjective. She has a knack for layering stacks of images, details and exact snapshots into place, separated by commas like beads strung into a kind of rhapsody. Each sequence is beautifully rendered... All memoirs are, by definition, collections of the past, but few interrogate it quite like Kathryn Harrison's On Sunset." "Transfixing... Fairy-tale fascinating, profoundly revealing of cultural divisions, and brilliantly and wittily told... Harrison's entrancing look-back casts light on resonant swaths of history." "Evocative and tender, this delightful memoir pairs the distant past with a safe and sacred time in the author's young life." "Blending family history and mythology, anecdotes and photographs, this book is not simply one woman’s open love letter to two magnificently eccentric grandparents; it is also a testament to the enduring power of memory. A poignant and eloquent memoir."